NJCTS would not be able to provide programs and services in every corner of New Jersey if not for its vibrant, dedicated volunteers! That’s YOU! We are always in need of teens, adults, and families to help spread the word, get some office work done, or help out at an event. If you would like to get involved and give back to an organization that has helped you, your family or friends, please take a moment to contact our office at info@njcts.org or 908-575-7350. You can get community service hours for school, scouts, honor society, etc. Or if you’re a working professional, your company may be able to make a corporate donation for volunteer hours worked! School In-service Presenters – We will train kids with TS or siblings of a kid with TS to advocate for children in school. We need volunteers willing to do faculty in-services and/or student presentations in every corner of the state. Mailings – Every now and then we need to send something to our entire database, and that means stuffing envelopes and getting the mailing to the post office. Grant Writer and Creative Fundraiser – We are looking for someone who is a skilled grant writer to assist in locating grant opportunities, writing grants, and developing other fundraising ideas. 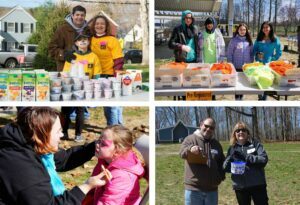 Event Steering Committee – We are seeking members for our events steering committee to help us plan our NJ Walks for TS and other events. Events – Help our staff organize, set up, run, and clean up on-site during one of our many events throughout the year. Individuals and groups of all ages are welcome to participate in helping us facilitate an event. Contact us for a list of upcoming events in your area. Physician Referral Network – Work with others to gather and maintain information on professionals with expertise and interest in treating children and adults with TS. Blogging – Our TSParentsOnline and Teens4TS blogs need contributors! If you would like to share your life story, engage a worldwide audience about a TS-related topic, or just share your writing talents, please let us know! To volunteer, please email us at info@njcts.org or call the NJCTS Office at 908-575-7350.